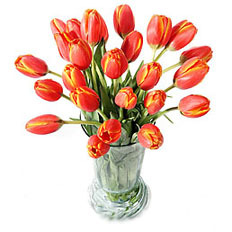 Delivery luxurious bouquet of Tulips to , Ukraine | | Spring bouquet from best florists. Must springtime last only three months a year? The spring is not a season, the spring is the state of mind. Make it last longer with this romantic bouquet of luxurious tulips. Each order includes an armful of tulips, hand-selected by our florists and shipped the same day. Note: Tulips arrive in buds and will begin to bloom within a few days after delivery. Send fresh luxorious tulips to Ukraine with us. Our couriers and florists has been at your service since 1999. Online help is always available.